There is something about a road trip that makes us feel nostalgic. It could be the open road, the mixed tapes we make for it, the excitement of traveling to a new destination, it’s hard to pinpoint, but there is just something that makes us excited about it. Unfortunately, that romantic idea of a road trip falls apart when you have to take kids with you. Kids don’t care where you are going, unless it happens to be Disneyland or some similar destination, they don’t care about your mixed tape filled with awesome music and they have never yearned for the open road. What kids want is to be entertained and kept from getting bored. The trick to having a great road trip is to keep the kids busy. 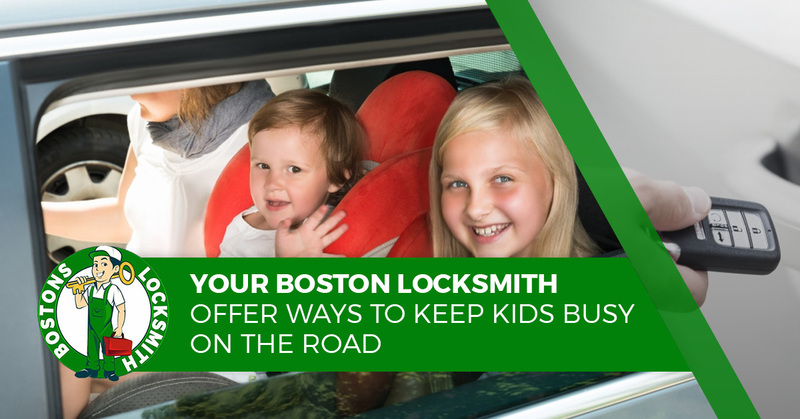 Bostons Locksmith offers ways to keep your kids busy while on a road trip. These days, television screens are everywhere including on your cell phone, tablet and inside cars and minivans. If you are going on a road trip, it is a no-brainer to bring along a device or have a television installed in your car. You will be surprised at how quickly time passes when your kids are in the back watching full-length movies and children’s programming. To make your trip even more peaceful, don’t forget to bring along headphones for the kids to use. Between hand-held games and game apps on your smartphone or tablet, children can keep themselves entertained for the duration of the trip. Video games may not be the most creative way to keep your kids occupied, but at least it is interactive. And more importantly, these games keep the mayhem confined to a small screen rather than with each other in the back seat of the car. This is a classic game you may have played as a child to occupy yourself while on a road trip. When someone spies a Volkswagen Beetle, they declare “slug bug” followed by the color of the car and they earn the right to punch the other person in the arm. Of course, if you are against such violence between siblings, you may have to skip this one. One goal of your road trip is the ability to keep the peace. One alternative is to offer food or toys as an incentive for good behavior. So it is a good idea to stop and pick up a few inexpensive toys and treats your kids love to keep them well-behaved until you reach your destination. When a road trip gets rough, sometimes you have to kick it old school. Pack some traditional games like Bingo, card games, Etch-A-Sketch and travel Checkers or Scrabble and encourage your kids to try them. You will be surprised when they declare these their favorite games. Here is an idea that doesn’t require an electronic device or WiFi, get your kids to read books you bring along. Comic books count as well. And should you be traveling through Boston on your trip and you lock your keys in the car, give Bostons Locksmith a call.